Here at Reliable Plumbing & Heating we take great pride in offering our Military and Senior citizens a discount on services and repairs. For our Military and Senior discount we offer 10% off any service and 5% on any repair that is needed. Call us today for all your plumbing needs! Save $25 on next Service & Repair. Discount Coupon! 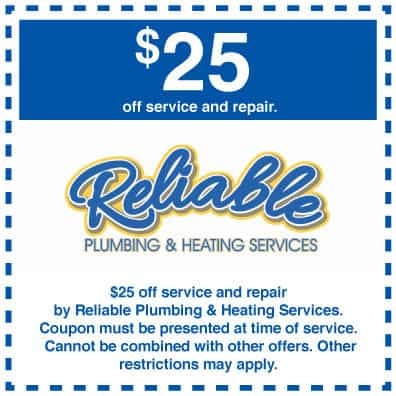 $25 off any Reliable Plumbing & Heating service or repair. Must be presented at time of service and may not be combined with other discount codes or coupons. Coupon for $50 off a Water Heater. 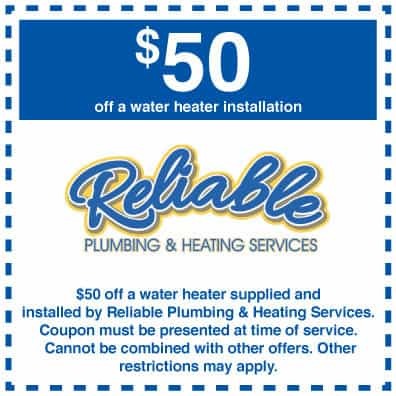 This is a discount coupon deducts $50 off a water heater that is supplied and installed by Reliable Plumbing & Heating Services. Must be presented at time of service and may not be combined with other discount codes or coupons. $200 off a Tankless Water Heater. 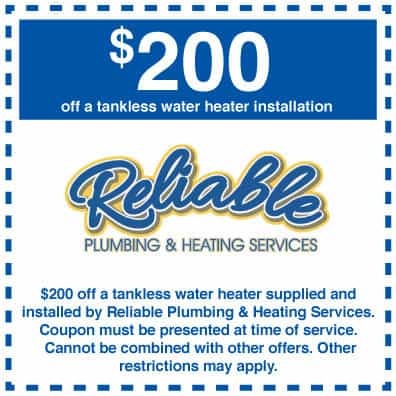 This discount is for $200 off a tankless water heater that is supplied and installed by Reliable Plumbing & Heating Services. Can only be used on Tankless Water Heaters.Must be presented at time of service and may not be combined with other discount codes or coupons.